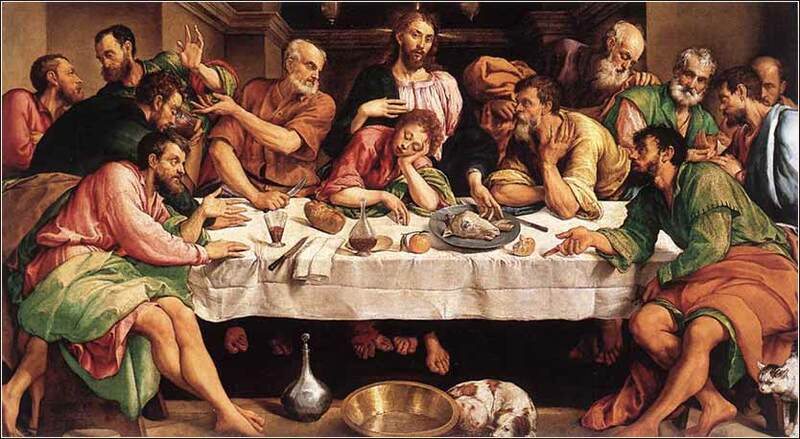 The Last Supper by Jacobo Bassano (Venice), ca. 1546. Most of the people are standing, as they would have done at early Passover feasts. Note the lamb's head, although the yeast bread is inauthentic. Peter is to Christ's right, and Judas skulks in the corner. 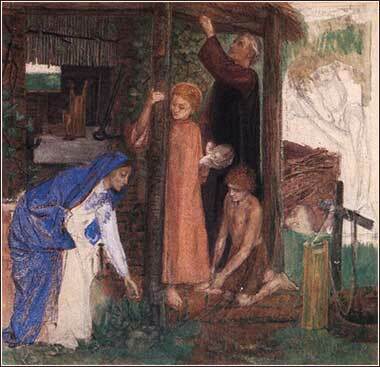 Gathering Bitter Herbs by Dante Gabriel Rosetti, pastel ca. 1856. On the first day you shall hold a holy assembly, and on the seventh day a holy assembly. No work shall be done on those days. But what everyone needs to eat, that alone may be prepared by you. And you shall observe the Feast of Unleavened Bread, for on this very day I brought your hosts out of the land of Egypt. Therefore you shall observe this day, throughout your generations, as a statute forever. In the first month, from the fourteenth day of the month at evening, you shall eat unleavened bread until the twenty-first day of the month at evening. For seven days no leaven is to be found in your houses. If anyone eats what is leavened, that person will be cut off from the congregation of Israel, whether he is a sojourner or a native of the land. You shall eat nothing leavened; in all your dwelling places you shall eat unleavened bread." Did you notice something odd about this passage? It determines how an event shall be commemorated, before the event occurs. And if you have ever wondered how the date of Easter is calculated, and why it is calculated as it is in such a terribly complex manner, here's your answer. Christ was crucified on the Passover, and so we use the Jewish calculation of Passover — given to them in Exodus 11 — to determine the date of Good Friday. Aside from the obvious importance of the events in Exodus, the commemoration of Passover is given direct, independent significance. The requirement to celebrate is worded more strongly than the Ten Commandments, in a way. By the direct terms of this Scripture, "if anyone eats what is leavened, from the first day until the seventh day, that person shall be cut off from [the congregation of] Israel." It was an offense punishable by expulsion and the duty to follow it is permanent, to be observed "as a statute forever". We often bemoan people who call themselves "Christians" and seem not to have read the Bible, or don't take it seriously. But the Jews have the same problem, because full-fledged members of the "congregation of Israel" are the exception rather than the rule. At least half of the Jews in Israel consider themselves "secular" Jews and do not even try to worship God as He commanded the Jews to do. And the count of "observant" Jews who worship Yahweh as He commanded is lower (and declining). Thus, a sizable majority of the people who claim ownership of the land of Canaan because it was given to them by God, have no right, no claim, for they are not really Jews. And will God fulfill his promise to allow the Jews to inhabit Canaan when great numbers of them turn their backs on him? If you believe the Bible, not necessarily. Time and time again, the histories of the Old Testament tell us how God allowed Israel to be conquered and the Jews to be taken into captivity because they ignored His statutes. So one must view Jewish claims of divine right to inhabit Israel with some skepticism. More Israelis need to read their deed! There is a kick-out clause. Nobody speaks for God, and whether or not He will preserve the current State of Israel from its enemies, we cannot know. But it is not a cut-and-dried question, at least in the minds of anyone who has bothered to read the Bible.